FAB course for bikers who want first aid training tailored for bikers. A lot of people ask us about first aid courses aimed at bikers & on social media, web forums & general chat, many bikers continually mention there has been a lack of Biker related first aid training being offered in Staffordshire such as “Biker Down” or “First on Scene” which is adopted in many areas. With this in mind we introduced in 2018 the First Aid for bikers workshop course – FAB for short – in Staffordshire. 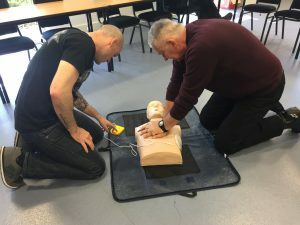 The FAB (First Aid for Bikers Course) was introduced 5 years ago by Train Aid inc who specify in workplace first aid training & community first aid skill tuition, as the principal instructor is a biker and realised the lack of REAL understanding around dealing with a BIKER SPECIFIC accident HAD to be addressed. A non breathing casualty may only have a few minutes before irreparable brain damage sets in. The course is developed and tutored by experienced professionals & trainers with extensive knowledge of motorcycle related injuries & those skills can be passed on to bikers who attend a FAB course. The tutor will also instruct you what you should & can do with the limited resources available at the scene of an accident until further help arrives. An ambulance or paramedic can’t always get there that fast so, it might be down to you to save another bikers life & those first 5 minutes could be crucial. With this in mind, we have partnered the Staffordshire Safer Roads partnership with TrainAidInc to offer a high quality training course, with an accredited & professional instructor on hand to offer training & advice as well as answers to the numerous questions regarding the handling of a situation where the skills you learn could one day help save lives. It may also be worth noting, that some (not all) insurance companies may offer a small incentive or discount if you tell them & have proof you have completed a specialist first aid course. Ask your insurance broker or adviser if they offer such a scheme when renewing or trying to take out a new policy. They may want a scanned copy of your pass certificate as proof. A 3 hrs workshop delivering BIKER SPECIFIC Emergency Life Support and First Aid at the scene of an accident. Modules include:- Incident Management, CPR and De-Fib use, Unconscious Casualty, Head Trauma and Helmet Removal, Spinal and Neck Injury Management, Shock and Bleeding, Fractures, Eye Injuries and Temperature Extremes. 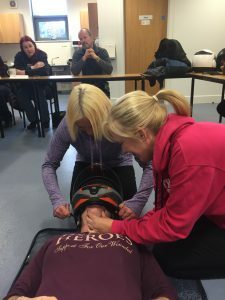 The session is a practical and hands on workshop offering updates for those that have done some First Aid Training before and with extra information such as helmet removal. This is a MUST for all bikers and road users. the course will run from 6.30pm to 9.30pm. booking in, in advance only and all it will cost is £15 – if you turn up & complete the course, you will get £5 back.. just as an incentive to come really!! You can find more details at all Staffordshire biker events such as Bikers Breakfasts, Biker barbecues, shows, meets etc & on the TrainAidInc website and the TrainAidInc facebook page where you can also book a slot. It’s also worth noting that many of the Staffs Biker / Think Bike team who you see at events or the Bikers breakfasts etc have already completed & passed the course during a pilot session of the course.